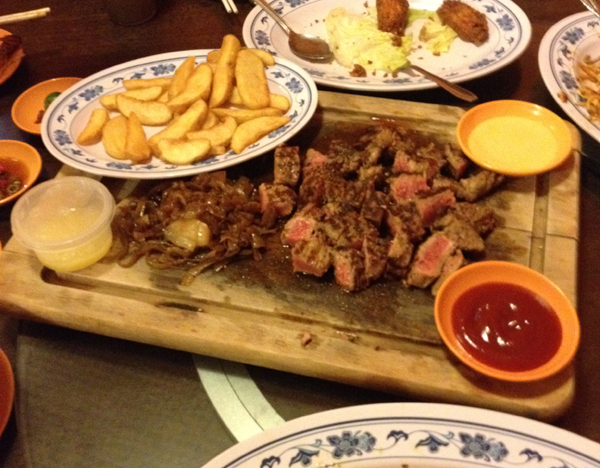 Best steak at a zi char place! New Ubin Seafood is quite a deceiving name. It isn’t located at Ubin and the seafood wasn’t the highlight of our meal. You can expect the usual zi char dishes but the whole point of finding your way inside Sin Ming Industrial Park is this plate of Certified Chilled U.S Angus Beef Rib-Eye Steak. This plate of broiled steak was unforgettable. Accompanied with caramelised onions and potato wedges, it could have easily passed off as a dish in a fancy restaurant. Even Larry (trust this American to know his beef) gave it the thumbs up. I don’t think you even need to use any of the three sauces – pineapple sauce, mustard and ketchup – that were provided. Now, the most authentic and incredible part of this plate of steak is that it duplicated the taste of the beef in another plate of beef fried rice. Such a brilliant idea to cook it in the remnants of the beef fats! This entry was posted in Food, Weekend belly treats and tagged feast, food, happy, photography, singapore, steak, yummy by lifestartsonfriday. Bookmark the permalink.